240SX Motoring on Facebook, 500fans and growing! Facebook being the new "myspace" has brought many loyal fans to join in and communicate with 240SX Motoring and their ventures of Time Attack. You can also check out News, updates, and specials that are going on. Please check it out and sign up as a FAN! Ryan Tuerck, a former Formula D driver for the 240SXMOTORING Drift Team in 2006, won yet another Formula D event for the 2009 Series. This finished up 2nd place overall for the 2009 Formual D Championship. SPL Parts are Now available at 240sxmotoring! We recently added the news member of our suspension line up - SPL PARTS! Please check them out here! Our EXPREME exhaust manifold is now available for SR20 owners who want a performance upgraded from the genuine exhaust manifold. With our product you can retain the genuine setup and no special modifications are needed to fit the standard turbo. With the SR20DET the exhaust manifold was designed to be close from the exhaust port to the turbine. With the comparison test of our isometric prototype & the factory genuine manifold which also utilizes the same layout, it shows that ours has succeeded in delivering an overall improved performance in both torque and power increase in areas like in the higher RPM range in which you were not able to utilize before. With our extensive testing we have reached the conclusion that the normal design is superior as a total overall efficiency. So to develop an exhaust manifold similar with the design and setup as the factory manifold we were finally able to produce a product worthy to bear our name as a product that has the potential to deliver an overall increase in performance. Do Strut Bars Really Work? This is a great article that was done by JDM Option Mag. Do Strut Bars Actually Work? Tein Performance Front Strut Bar. Each bar is specifically designed for its application. Constructed from A6000 aluminum and two-column oval design for increased rigidity. Tein Performance Bar are also compatible with EDFC for Tein Coilovers. Was cleaning up the shop last friday and noticed a box of old valves and valve springs that was used in our time attack car. Instead of tossing them into the garbage, I thought it would be nice to create some CIP art! We recently updated our 240sxmotoring.com website to help accomadate a easier and friendly navigation to products. We added more sections in a broader range to help the customer find the part they are looking for faster and efficiently. We are still updated the site as we go but the major change was published and visable to the public. Please check it out and point out anything you don't like about it or do like about it and if there is any problems/concerns that should be brought to our attention. Designed originally for racing engines, today’s compact production engines can also benefit from the used of GReddy’s Radiator Bleed Tank. By mounting the tank high up in the engine compartment, you can be assured that of a fully filled system with room for air expansion, thus reducing chances of overheating due to air-lock. Block-off radiator cap included. I definitly recommend this to High Reving SR's or KA's where cavitation can occur. This can also prevent damage to the motor when overheated, ie. Headgasket Failure. -With the use of the high quality valve and diaphragm control system, the type-RZ was created to be the most reliable Blow off valve system available. -New designs allow for high capacity and performance that rival high performance Blow-off Valves, While being more compact and lighter-weight. -The unique 8 discharge ports in the CNC machined aluminum discharge funnel draws surrounding air to amplify blow-off sound. -The CNC machined aluminum valve is coated with a hard anodizing, to withstand extreme friction, maintain an airtight seal and increase durability. -To ensure proper valve movement, a durable, airtight, pressure resistant Bellofram diaphragm is used. -A carefully selected spring rate, prevents premature discharge under high boost pressure and increases valve speed for quick response application. -The spring tension can be tuned by the adjustment screw, to suit mass applications. -The Discharge funnel can be replaced with an optional, Re-circulation Hose Adapter to allow re-routing of the discharged air back in the air intake system. -Re-circulation Hose Adapter is not included in the Universal Blow-off valve Type-RZ Kit. These come complete with both passenger and driver side inners and outer tie rods. Strengthened Tie Rod Improved durability and increased steering wheel cut off angle. This will allow for a higher steering angle at full steering wheel lock. All for a reasonable price. Superior Durability Tein tie rods are designed to be stronger than original equipment found on the 240SX (S13 and S14). During hard sport driving, breaking and bending of the tie rods will now be reduced. Increased Steering Wheel Cut Off Angle Tein tie rods are adjustable to give you more steering angle at full steering wheel lock. Original equipment tie rods offer limited steering wheel rotation, while Tein tie rods allow for increased rotation. Excellent Option For Drifting Tein tie rods can be adjusted for more steering angle for when you counter steer. This will in turn create deeper drift angles. What can we say, this thing is awesome! The craftmanship put into this is unreal for the price. Hand made rolled steel. The welds are done by Tig. By far the best turbo extension(elbow) out on the market that FITS the US Left hand drive car. YEP! this one actually clears the steering shaft unlike those Ebay ones which were made for Right Hand Drive models. The best part is the diverter that is in the elbow that lets turbo exhaust gases not interchange with the wastegate gases. This makes less restriction on your internal wastegate to allow better flow and response. Another reason why this GReddy elbow is superior to all others is that it actually included new STUDS for the turbo outlet and new hardware for downpipe. AND S13 Skinny o2 sensor owners can now retain their stock o2 sensor because it includes an o2 adaptor. Otherwise other elbows on the market make you buy a Fatty 02 sensor for an additional $95!!!! This elbow fits ALL SR20DET Motors using T25 or T28 Turbos. Can be used with GT2871 also. HKS Rocker Arm Stoppers, Nissan SR20DET, 91-98 S13. Helps prevent valve float on all S13 SR20DET engines. A must for use with aftermarket camshafts, or any SR20DET reving past 7400 RPM. A small price to pay to prevent a bent valve. It's one of those things "why not", when you have the head apart or just changing cams. HKS has been around since the beginning. Buy brand name and you won't regret it. We have done MANY headgasket installs in the past, and we have always used either Apexi or Cosworth. Not once have we had a problem with either. We rely on them over any other brands. We rather do a headgasket once and not worry about it again. The oem SR20DET Timing Chain is a no-brainer to replace when either doing a headgasket or oil pump. The timing chain takes a beating on SR's, especially if you are high-reving your motor during racing. Last thing you need is the chain to break and cause a huge loss in your pocket. Timing chains can stretch over time, causing too much play, which can wear timing chain guides rapidly or even cause the chain to snap. So next time you are working on your engine overhaul, think about investing in a new timing chain for a safe peice of mind. Finally an aftermarket oil pan that is reasonably priced! This Moroso Oil pan is HAND TIGGED in house at their Guilford, CT location. YES AMERICAN MADE!. The welds are perfect and definitly show the hard work and time that is put into making one. It is all sheet aluminum press bent and welded. Also features a magnetic oil drain plug. All hardware is supplied with this for flawless install. Stock pickup depth so there is no changes on the OEM oil pickup. There are 2 hinged baffles to allow for proper oil supply to the pickup when corning hard or drifting. The Moroso pan also allows for 4.75qts of oil to be used. Check Out More Picture and Purchase Moroso Pans Here! The DiF water Neck adaptor allows for the use of a water temp gauge sensor to be inputed into the upper radiator hose. Instead of either welding a bung in your radiator or installing a T fitting in the hose, this adaptor installed between the oem water neck and the head. Thus giving you a clean install and an acurate reading as it is positioned as close to the head as possible. Another great feature about this product is that it is groved to allow RTV to bond consistanly with the OEM mounting surfaces. To make even better buy, they included a free tube of RTV to complete this install. The DIF water neck adapter is designed to allow an addition of a 1/8" port to the water neck on the SR20DET engine without having to cut or modify existing radiator hose(s). Each water neck adapter includes a 1/8" NPT bung, a water neck adapter, and all necessary hardware and sealant for simple installation. Each water neck adapter is CNC machined from billet 6061-T6 aluminum, brushed, and clear anodized. To order, Check It out on here at 240sxmotoring.com! Crow 5point Race Harness - Definitly best buy! Finding a harness that is SFI approved, yet not killing bank with a $400 bill is always WIN!. These Crow 5point Race Harnesses are the answer to your budget saving agenda. At only $150 for a set, you really can't go wrong. They meet all the SFI specifications and get the job done. One more good thing that Crow offers is their re-certification program. So don't think of these as an expense but as an investment, as these will last years after years of use and will only cost you a small portion to send them back in for re-certification. Crow 5point Racing Harnesses Available Here! Haltech has released a standalone engine management system for the tuner that is on a budget! This Spring 500 unit has all the major features as the high-end Sport 1000, just minus a couple things that brings cost down. Check it out here! You will be surprised on what this standalone can do for only $895! Two new parts were recently added to the Circuit Sports line-up. CS is now offering front and rear lower control arms for the S-chassis. Circuit Sports adjustable front lower control arms for S13/14 240SX. Adjustable FLCA's allows full adjustment to front suspension in conjunction with tension rods, steering tie rods, and camber plates to dial in their car for track and drift use. High glaze powder coat finish for durability and long lasting finish. Circuit Sports adjustable rear lower control arms replaced OEM fixd rubber type bushings that most often is already wore and torn on the 240SX's. The adjustable rear lower control arms also allows full adjustment with the car's rear suspension links (rear traction trailing links, rear toe, and rear upper control arms) to fully work with each other in conjunction to dial in your car's suspension to take advantage on the track or drifting. High glaze powder coat finish for durability and long lasting finish. * All Circuit Sports suspensions were produced with high quality tolerance and R&D. Please do not confuse these units with cheap price China knock offs you see on the net from other resellers or Ebay. We guaranty mere side by side comparison will show the quality difference. * All Circuit Sports products are now backed by LIFE TIME limited warranty against defects and workmanship. Uploaded a video from practice at Round 3 in Chicago, IL. Had lots of heating issues during the day causing me to run 2-3 hard laps at most then a cool down lap. Overall, the track was very fun to drive and I can't wait to go back again next year. I ended up finishing 2nd place in Unlimited RWD for that weekend. Posted a new video I had on my camera from early summer 2009. Finally got around to posting it on youtube. I ended up taking first place in Unlimted and 2nd overall for the weekend. We are now DIRECT dealer of Tanabe products! Tanabe has been around for awhile, and until now, we are offering these high quality products to our customers. Here is a little write-up on Tanabe: Made in Japan, made in Tanabe. With over 20 years of experience in the development of quality automotive parts for performance application, we take pride in all our products engineered to the strictest of tolerances, produced with the highest quality materials, and made within our very own advanced ISO9001(International Organization for Standardization) & JISQ9001(Japanese Industrial Standard) certified manufacturing facility located in Shiga-city, Osaka-prefecture, Japan. Race Tested and engineered to perfection, get an edge over the competition. Fuel the racing spirit! These Extended studs are back in stock and are cheaper! Circuit Sports 60mm long wheel studs. Replaces the stock studs with longer studs for use with added wheel spacers and open ended lug nuts. Made for factory Nissan hub knurl, will not work for aftermarket branded 5 lug hubs. SOLD INDIVIDUALLY!!! so 5luggers need 10x front and 10x rear. SEMA is Around the Corner! Every year our industry gets together with vendors, buyers, and manufactures to show the new upcoming and greatest products out for the automotive scene. 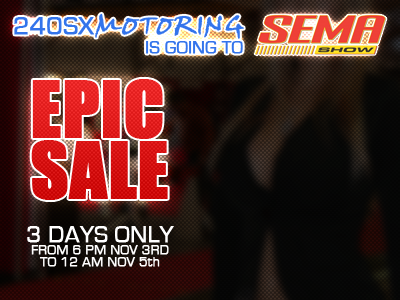 SEMA is held usually the first week in November. And of course, we all go to SEMA to talk "business". However during that time, no one is at the shop! That means we actually close our business for a couple days to make our way out to Las Vegas, Nevada. This year our days we are going out there is a tuesday through thursday. Since we will not be at the shop to fulfill orders, take phone calls and ship out products, we will be offering a "SEMA SPECIAL" page that will list a bunch of popular parts at COST! But the biggest question we ask ourselves is, what products do we offer at the special price? So we decided that it would be best to hear from the our customers on what they want. This way we can better prepare our shelves with the products that are going to move on special. So please email us, comment here, or hit us up on FACEBOOK! Your premier source for performance aftermarket parts. We are a top-tier distributor of Greddy, Kaaz, Stance, OS Giken, and more!